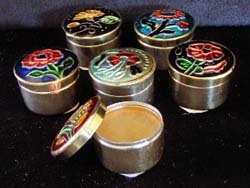 Song of India Solid Perfume in Brass Tin - 7 great all natural fragrances, made from Aloe Vera, Jojoba Oil, Wheatgerm Oil, Essential Oils in a Beeswax Base. Unique hand crafted painted Cloisonné (Meena) Brass Jar 4g. Your choice of Amber, Krishna Musk, Nag Champa, Neroli, Night Queen, Patchouli and Sandalwood.